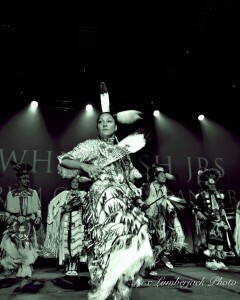 Michelle Sanderson in full jingle dress regalia, at We Day in Saskatoon, in front of 15,000 screaming students! Greetings to everyone in Treaty Six Territory and beyond. My name is Michelle Sanderson. I am the First Nations and Metis Achievement Consultant for Living Sky School Division. I began my assignment in November of 2013. Prior to this assignment, I have taught in classrooms in Saskatoon, Canoe Lake, Witchekan Lake and Muskeg Lake during my short 9 year teaching career. I recently returned to school in 2010 to attain my Master of Education. I am newly convocated and am grateful for the break in studies. I am a traditional Cree and have practiced living a cultural life as taught by my parents and relatives. I am trying very hard to learn our languages from these lands. I am very honoured to have this assignment to help positively affect the achievement of my people. I hope my education and expertise will be helpful during my post and I hope to make friends and to hear from each and every one of you. I have researched and uploaded a variety of links, which I hope are helpful, to assist teachers, administrators and support staff to to meet their curriculum objectives and to enrich their teaching expertise. I have separated the websites according to Indigenous Knowledge and Anti-Racist Education. I went to every page that is uploaded and made sure the links are live, recently updated on September 11, 2015. I wish you good luck on your teaching/learning journey for the 2015-2016 school year. Feel free to contact me, to help, assist in any way regarding First Nations achievement, promising practices, culture, curriculum outcomes and indicators and anti-racism. Day 1 and Day 2: November 9th & 10th, 2015. Day 3 and 4: December 9th and 10th, 2015. There is an anti-racism conference scheduled for October 23, 2015 at the Education Building at the U of S. If anybody needs funding to take LSKY students, I will do my best to accommodate. As well, I do currently do presentations on anti-racism, white privilege, and allies at schools. Please email me for more information or to put in a request.